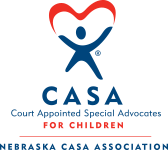 CASA (Court Appointed Special Advocate) volunteers are well-trained and speak in court for the best interest of abused and neglected children. These children are in court due to no fault of their own. All of the children are victims of abuse and neglect. CASA volunteers are appointed to a case by the judge. The volunteer's goal is to provide a carefully researched background of the child to help the court make a sound decision about the child's future. Each home placement case is as unique as the child involved. The CASA volunteer researches the child's best interests to stay with his or her parents or guardians, be placed in foster care, or permanent adoption. The CASA volunteer makes a recommendation on placement and follows through on the case until it is permanently resolved. CASA volunteers are often the only stable factor in an often frightening and difficult ordeal for a child. For more information on becoming a CASA volunteer, click here.